Nestled on 30 oceanfront acres alongside idyllic Great Bay, The Ritz-Carlton, St. Thomas is comprised of a small group of elegant plantation-style buildings situated along the powder white beach of Great Bay. It is a place to experience moments of dream-like island escape, perfected through the renowned service and amenities of The Ritz-Carlton. This luxurious 2 Bedroom, 2.5 Bath condos at the Ritz Carlton St. Thomas has all the amenities you could want in your ultimate island getaway. Your condo has a fully equipped kitchen, stainless appliances, granite counters, breakfast bar and dining area. You also receive twice daily maid service. Located on the east side of St. Thomas, the Ritz-Carlton sits gracefully on 15 acres of sloping beachfront property. 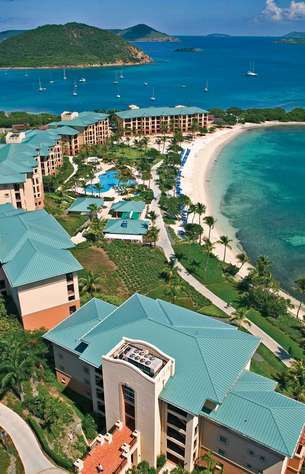 The Ritz-Carlton, St. Thomas, was named the number one resort property on the island by Fodors. Experience unparalleled pampering, from a relaxing cliff-side massage to an elegant dinner in the Great Bay Grill to a sunset cruise on the resort's catamaran. Feel at ease, knowing your Ritz-Carlton Concierge will take care of everything. We can even have your fridge stocked with groceries prior to your arrival. 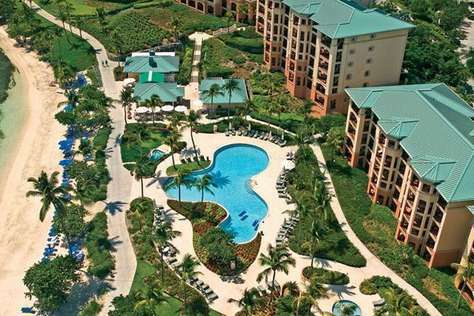 The Ritz-Carlton, St. Thomas is 20 minutes from Charlotte Amalie, 30 minutes from Cyril E. King International Airport, and 15 minutes from St. John's by ferry which leaves from nearby Red Hook. PLEASE NOTE: This condo rents on a Saturday to Saturday basis and can not overlap weeks. We also have 3 bedroom, 3.5 bath units, as well as 2 Bedroom Suites that include a complimentary full breakfast daily. Suites rent on a Friday to Friday basis. Although the calendar may be blocked off for certain dates, we may still have other units available. PLEASE CALL FOR DETAILS! This luxurious 2 Bedroom, 2.5 Bath Suite at the Ritz Carlton St. Thomas has all the amenities you could ask for in the ultimate island getaway. The suite has a galley style kitchen, granite counters, breakfast bar, and twice daily maid service. Located on the east side of St. Thomas, the Ritz-Carlton sits gracefully on 15 acres of sloping beachfront property. 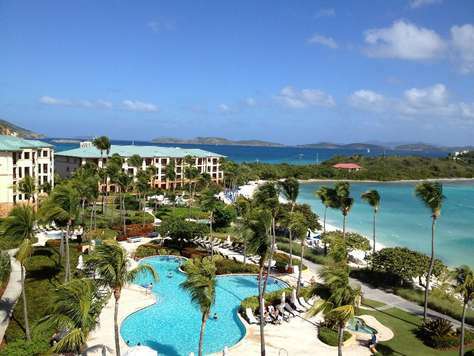 Sharing the site is The Ritz-Carlton, St. Thomas, named the number one resort property on the island by Fodors. Experience unparalleled pampering, from a relaxing cliff-side massage to an elegant dinner in the Great Bay Grill to a sunset cruise on the resort's catamaran. Feel at ease, knowing your Ritz-Carlton Concierge will take care of everything. We can even have your fridge stocked with groceries prior to your arrival. PLEASE NOTE: This condo rents on a Friday to Friday basis and can not overlap weeks. Also, if you email me for information, please check your spam folder for my reply email, as many times it ends up there. Thank you! This luxurious 3 Bedroom, 3.5 Bath condo at the Ritz Carlton St. Thomas has all the amenities you could want in your ultimate island getaway. Your condo has a fully equipped kitchen, stainless appliances, granite counters, breakfast bar, dining room, and twice daily maid service. PLEASE NOTE: This condo rents on a Saturday to Saturday basis and can not overlap weeks. Also, if you email me for information, please check your spam folder for my reply email, as many times it ends up there. Thank you!